But Last.fm also needs to read back the scrobbled data, right, to calculate relationships between users and artists and tracks and tags? Doesn’t latency matter then? Oh, if only you weren’t an ocean away! Must be a nightmare having to deal with last.fm’s data. I’ve had to denormalise databases to help them scale, but this field of work seems to be on a completely different, almost scary, level. Great post! It is, indeed, an exciting time for this kind of development… I’d love to hear your thoughts on how Amazon’s AWS measures up, or fails to measure up, to your requirements. Kimiko – we try do that using “batch” processes which run on the data in offline mode and then feed the results of these calculations back into the system. Querying the data in realtime would indeed require low latency, something the HBase product that martind mentioned doesn’t seem to provide yet (but it’s early days for HBase still). It’s a mess, but you guys are working on it! If only I was a little bit older, an ocean closer, and slightly more than slightly more computer sciencey…. Can’t comment much on the technical matters (I’m pretty tech-savvy, but that’s way beyond me). 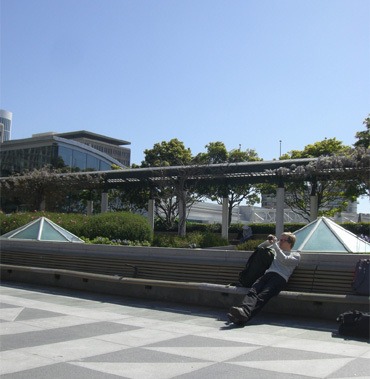 But I’m curious about that photo: what were you guys doing at Yerba Buena Gardens in San Francisco? I work just a couple of blocks from there. And the Hadoop site claims the summit was in Santa Clara. ah that’s what that place was called, thanks! This was the last day of our trip, we visited some startups in the city before we left. You think that the existing data storage solutions are too expensive or too outdated. Most of the current solutions are too monolithic in my opinion. A more modular approach with lower access latency would be a dream of any data digger. you do realise that hadoop has been almost a pet project for yahoo! right? i mean, doug is himself with yahoo! Oh, I want to know more and would appreciate if am selected for this job role. It´s cool that you can press T to add tags but its a real pain in browser tab enabled browsers, if you know the know what I mean.